We are currently in the midst of an intense campaign to end the exemption of licensure for those providing mental health services to state agencies until July 2023. The NYSSCSW, both the City and State Chapters of NASW and the New York Association of Deans of Social Work have contributed to this critical battle to oppose an executive budget recommending a five year extension of the exemption. Every person in need of mental health services must be diagnosed by a provider licensed to diagnose – not just those with insurance coverage or wealth. On March 21, 2016, the Society launched a E-blast to all our members asking that they contact their State and Assembly legislators advocating for elimination of the exemption. The Governor’s budget is expected to be passed with or without a version of the exemption by March 31, 2016. Despite the fact that the Legislature passed our bill last year only to be vetoed by Governor Cuomo, we had hopes that it would reappear as part of his budget in 2016. It actually did, and then it vanished. The reorganization of the entire Workers’ Compensation Law was deemed insufficient and so our inclusion as providers was put off until more work is done on the entire law. It looks like we will have to reintroduce our bill next year to keep the issue fresh. Two bills have been introduced to amend the public health law in relation to requirements for collective negotiations by health care providers with certain health benefit plans. It does not affect federal ERISA plans. In NYS more than 51% of insurance plans are self-funded (ERISA supervised) and therefore not subject to state regulation. This a beginning effort to advance providers ability to negotiate with insurance plans around issues (fees, oversite etc.) which have been illegal up to now. Unfortunately, all of these bills have fallen off the radar screen for now. The Legislature is focused on totally the governor’s budget recommendations. April – June may bring more activity. Stay tuned. Attachment below is a page from the "People's Budget" which is the document that sets forth the 2016 budget priorities for the NYS Black and Puerto Rican Caucus. Mental Health Equity is our exemption issue. Their support is fabulous and hopefully will help end the license exemption thus forcing all agencies to hire licensed professionals to provide psychotherapy.. The Caucus is composed of all Black and Puerto Rican Senators and Assembly members. There are no regulations written yet on this 2015 law. The Rural Resource Commission is in charge of providing these regulations. Because of the opposition by the insurance industry and government agencies at both federal and state levels, there is little chance of movement for these bills beyond house floors. The penalties are very low for insurance company infractions - i.e. parity infractions, medical necessity restrictions, etc. Thus enforcement risk is basically just a cost of doing business for the insurance companies. NYS is one of the last states to continue to interfere with different professions forming businesses together. Assemblyman Pretlow is planning to introduce a bill to allow PhDs, LCSWs, and MDs to form corporations as equals. The Department of Financial Services missed signals of Health Republic's financial failure because of deals on the federal level. Health Republic was formed as an Insurance Cooperative, but it was known that such entities were a risk. Never done before, rates were guessed at. The Federal Government created a loan/grant program for all these cooperatives to cover costs when and if rates were incorrect. However when Congress was unable to revoke the Affordable Care Act, they instead defunded this loan program by 88%. NYS was monitoring the Health Republic Cooperative with the belief that there was Federal backup money available and unaware that it had been quietly stripped out. Therefore the Department of Financial Services approved another year (2015) for Health Republic. Then when Health Republic could not continue and needed to access the loan funds, it was suddenly realized there was nothing there to rely upon. In September 2015, Health Republic reported they had to shut down. The state then made them close one month early to prevent the delivery of services that would never be paid. The FED will forgive the 200 million dollar loan borrowed by Health Republic through this process, with a percentage of reimbursement going to vendors and providers. Although figures are not yet known, it looks like $.06 for every $1.00 will be paid and vendors will be paid before providers. This is considered a liquidation, not bankruptcy. This issue continues to be addressed although there are no updates to report as yet. On June 19, after NYSSCSW introduced repeated bills for years in the New York State Legislature in coordination with the state Chapter of NASW, our bill finally passed both houses. Next step is for Governor Cuomo to sign it into law. Once it is law, LCSWs, in addition to licensed psychologists, will be reimbursed for mental health services to Workers’ Compensation patients. Stay tuned for an important letter writing campaign to urge the Governor to make the bill law. In his continuing effort to address the unavailability of OON, Senator Kemp Hannon has introduced a second bill (S. 7140) that will allow HMOs to offer OON coverage outside the NY State of Health marketplace regardless of whether such coverage is offered in the marketplace. Senator Hannon moved this bill out of the Senate Health Committee this week. Your continued support in the form of letters to the Senate and Assembly leadership is very important to the Society’s efforts to address the OON coverage problem. See list below. Note that the recently passed budget called for the creation of a Workgroup to review OON reimbursement rates and OON coverage in the individual and small group markets. The Workgroup will be co-chaired by the Commissioner of Health and the Superintendent of the Department of Financial Services and include 7 other members: 2 physicians, 2 health plans, and 3 consumers. The Workgroup has been charged to consider the availability and adequacy of insurance coverage and make recommendations for legislation and regulation by January 1, 2016. The legislative session is scheduled to end on June 19th and the Society will keep you updated on this matter along with the rest of our legislative agenda. As I indicated in last week’s E-News, the Society has been closely following the response by Governor Cuomo and our Legislature to the problem facing patients who are unable to obtain out- of-network (OON) coverage for health care (and ultimately mental health care). Senator Kemp Hannon (R-Garden City) and Assemblywoman Linda Rosenthal (D- Manhattan) introduced legislation to require that insurance policies offer OON coverage (Senate bill # S. 6207 and Assembly bill # A. 8494). We continue to ask Society members to write support letters to these legislators and health care leaders in the legislature. (See below for names.) For those who have already written, thank you….it is making a difference. HISTORY: Out-of-network benefits are one of many issues which were lobbied by the Medical Society of NYS (MSSNY) and others in the recently passed State Budget. MSSNY has characterized this “new world” of insurance---with all the attendant problems-- as something quite similar to that which existed when managed care was initially ushered in. As consumers and providers became increasingly aware of the lack of OON coverage, legislators and the Governor’s office heard many complaints. As a result, it became a topic in the overall budget negotiations this year. The administrator for New York State of Health (NY’s health care exchange program) indicated in February that the State might require the participating insurance companies to offer out-of-network coverage beginning in 2015. The final State Budget included consumer protection provisions intended to prevent exorbitant, “surprise bills” for patients who were seen by physicians not in network, mandating notice and more transparency. An arbitration-like process for billing disputes was also added. With respect to out-of-network coverage, the budget included provisions that will require insurance companies that currently offer products that include OON benefits to group customers to also make available a separate product that reimburses those out-of-network services at 80% of the “Fair Health” rate. It must be remembered that even if businesses have these insurance options, they may not purchase them for their employees. These OON provisions will go into effect in April, 2015. The Society’s lobbyist, together with NASW-NYS, has a meeting scheduled with the administrators of New York State of Health in the next few weeks to express our concerns. We have been in contact with the out-of-network bill sponsors, but it is important to continue writing letters to the legislative leaders (Assembly Speaker Silver, Senator Skelos and Senator Klein) and Senator Hannon and Assemblywoman Rosenthal expressing why this problem must be solved. We will continue to monitor this issue and report back to you with any developments. The Governor’s 2013 Executive Budget seeks to make permanent the exemption from social work licensure for individuals working in programs that are regulated, operated, funded or approved by the Office of Mental Health, Department of Health, Office for the Aging, Office of Children and Family Services, Department of Corrections, Office of Alcoholism and Substance Abuse Services, Office of People with Developmental Disabilities, and local government units or social services districts. The NYSSCSW has joined with both chapters of NASW and the Association of Deans of the Schools of Social Work to OPPOSE permanent exemption. The Governor’s proposal would allow broad sections of the workforce to be unlicensed individuals who have not met minimum qualifying education, experience and examination benchmarks, to diagnose and treat serious and persistent mental illness. The licensure law was implemented to provide a minimum standard of competence for all mental health providers. Allowing unlicensed providers to engage in the LMSW and LCSW scopes of practice puts consumers at risk. A broad-based permanent exemption creates a two-tier system of mental health care: one for those who receive publicly funded services and another for those with private health insurance. For example, the Empire Plan is a comprehensive health insurance program for New York’s public employees and their families. The plan covers a range of mental health and substance abuse services but only provides reimbursement to the “highest levels of licensure in NYS,” which includes a licensed psychiatrist, licensed psychologist or licensed clinical social worker with the “R” insurance privilege (LCSW-R). If a NYS employee uses mental health care using their state insurance plan, they access clinicians who have the highest level of licensure. However, if a consumer accesses services through a program operated, funded or regulated by an exempt state agency, they may be served by unlicensed and unqualified individuals. A permanent exemption would freeze this NYS-sponsored disparity in quality of care. I am strongly opposed to broad-based permanent exemptions included in the Governor’s budget. Unlicensed staff lacks sufficient skills, knowledge, experience and supervision to competently engage in tasks such as the diagnosis of a mental illness and psychotherapy. Utilizing unlicensed staff to perform such tasks which are restricted to licensed professionals presents a risk to the welfare of mental health consumers. 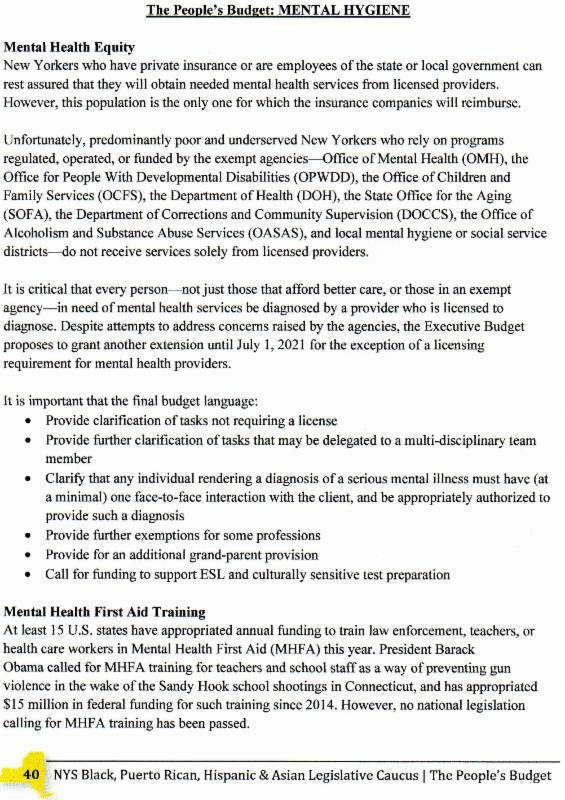 All mental health services in New York State should be provided by competent, qualified and appropriately licensed providers. I support NYSSCSW’s budget-neutral compromise which extends compliance for licensure by New York’s state agencies down the road toward and urge you to do the same. SECOND: We need CONSTITUENTS ONLY to contact their LOCAL legislators ASAP. Please send us feedback about your calls! Email us at [email protected]gmail.com. School Social Workers serve a critical role in our educational system, tackling the social, emotional, behavioral and mental health needs of students that are proven barriers to student learning. Research has shown their services improve academic and behavioral outcomes, promote a positive school climate, and provide effective and vital student support services by maximizing school based and community resources. School Social Workers possess both a certification (issued by the New York State Education Department Office of Teaching Initiatives) and a license as a Licensed Master Social Worker (LMSW) or Licensed Clinical Social Worker (LCSW) under Article 154 of the Education Law. Within the context of such licenses, strict comprehensive clinical educational and experiential requirements are defined for each scope of practice. Such clinical core competencies exceed that of the Licensed Marriage and Family Therapists, Licensed Mental Health Counselors, Creative Arts Therapists and Psychoanalysts. Absent extensive changes to core clinical curriculum for such licensees, we, the above noted, must oppose this bill. While we assume the motivation for SB 6002 / AB 981 is to expand the pool of mental health providers serving the needs of our children, we do not think it beneficial (given the oftentimes complicated mental health needs of children) to do so, with practitioners whose current clinical education and experience is less than school based practitioners presently providing services. The shortage of mental health services for children is not solved by opening the door to more mental health professions, especially when they have not been trained to work within an educational setting. Licensed Marriage and Family Therapists, Licensed Mental Health Counselors, Creative Arts Therapists and Psychoanalysts have a great deal to offer through community agencies where the Office of Mental Health can oversee licenses and insure the appropriate clinical supervision prescribed in their respective licensure statutes. For the above stated reasons, we collectively oppose SB 6002 / AB 981.